The IB Program requires a student to select courses in the six groups identified below. 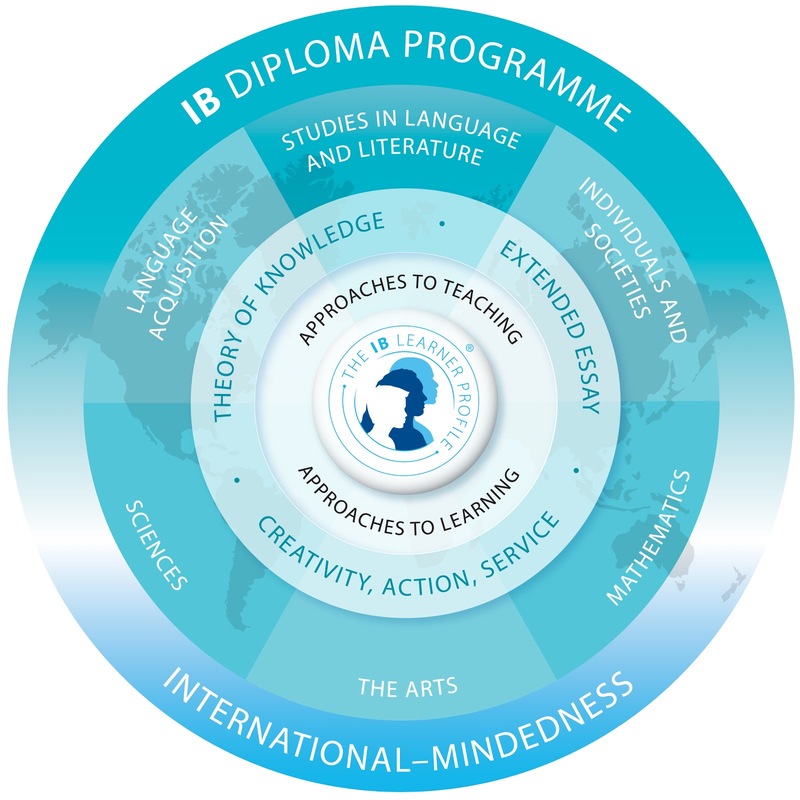 To obtain an IB Diploma, candidates must successfully complete a course and write an international examination in each of these areas of study in their final two years of secondary school. Students study courses from each of the groups for a period of two years. Of the six courses, three and not more than four are to be taken at the "Higher Level" and the remainder at the "Standard Level". The curriculum is modelled by six academic areas surrounding the three core requirements. the remaining three subjects are studied at standard level. Student achievement is assessed according to specific performance criteria established by the International Baccalaureate Organization. There is both internal and external evaluation used in the IB Program. External Assessment Written examinations are set by the Chief Examiners and evaluated by over 2,000 assistant examiners from all over the world. These examinations may include essay and short answer topics, document based and multiple-choice questions. Internal Assessment According to the requirements for individual subjects, assessment may take the form of major written assignments, or project work in Mathematics and the Sciences. Internal assessment is first carried out by the teacher at Colonel By, and then goes to an external moderator to insure uniform standards of evaluation are maintained. Up to three additional points may be awarded for a student's combined performance in the Extended Essay and Theory of Knowledge papers. The Diploma is awarded to any student who meets or exceeds 24 points and who has no failing conditions. Students who elect to pursue the International Baccalaureate Program will be guaranteed outstanding preparation for further academic study at university. Successful completion of the Diploma allows students to be considered for admission to many universities and may often receive advanced credit and/or placement for those courses in which they have received a 5, 6, or 7 score. Please refer to individual university documentation (through registrar's offices and university calendars) for current recognition policies. The IB is however, more than superb academic preparation. It encourages responsible citizenship, tolerance, and a consciousness of the shared humanity which binds us all together. We are citizens of a globe of tremendous diversity; IB recognizes and encourages us to become active members of this society.